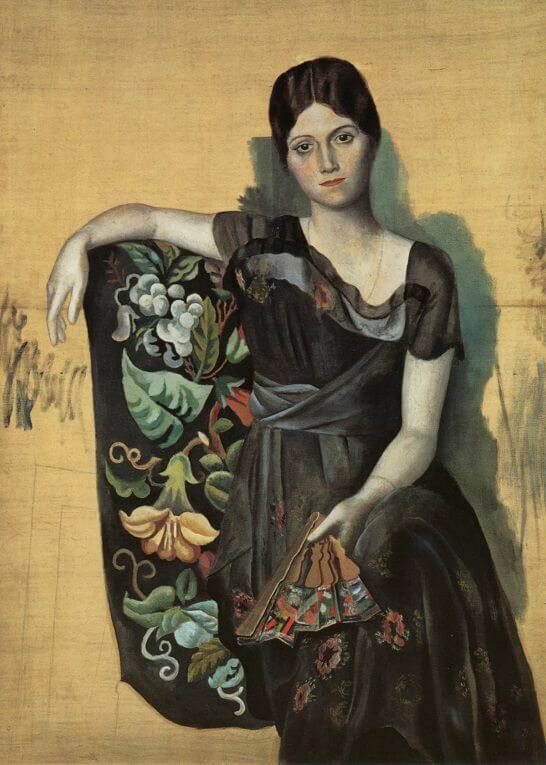 Return to Picasso's Spanish roots is significant with this stunning figurative portrait of the Ballets Russes ballerina, Olga Koklova, soon to become his first wife. As with his previous lovers, Fernande and Eva, he reinstates traditional realistic, aesthetic methods to contemplate beauty and its relationship to art. Here, Olga serenely sits with a marmoreal, doll-like face looking down wistfully at the viewer. The wonderfully painted backdrop of the chair and the colourful, half-opened fan mitigates the severity of the black clothing and tight black hair. The blue shading around Olga's form, which throws her further into stark relief, almost seems unfinished as with the blue background that haloes around Eva in The Artist and his Model (1914). Picasso's involvement with Olga and the Ballet Russes revolutionised his life style as he started to mix with high society, following the troupe around Europe. When Apollinaire finally married in spring 1918, Picasso was inspired and married Olga in July. They honeymooned in Biarritz, feted by this social centre of aristocracy and beautiful people, and returned to Paris late September where they moved into a house in a glamorous district. The sudden death of Apollinaire from flu two days before Armistice Day shocked the arts world.